Peter Scott at WWT Slimbridge in 1954. Peter Markham Scott was born on the 14th September 1909 in London, England and was the only son of the famous Antarctic explorer Captain Scott and sculptor Kathleen Bruce. Peter was only two when his father died during the ill-fated exploration to the South Pole. In a letter to his wife, Captain Scott expressed his wish for his son to become interested in natural history, which she duly encouraged. His middle name was Markham and was taken from the mentor of Scott’s polar expeditions Sir Clements Markham. Peter was educated at Oundle School and went on to Trinity College, Cambridge where he read Natural History before going on to graduate in the History of Art in 1931. Peter Scott had an artistic talent and went on to exhibit his work in London in 1933. Due to his financial security, he was able to follow his Art and Wildlife interests together with various sporting activities such as sailing where he represented Great Britain and Northern Ireland at the 1936 Berlin Olympic Games winning a Bronze medal. During the Second World War, Peter Scott served in the Royal Navy as a Sub-Lieutenant where he served in Destroyers in the North Atlantic and later commanded a Squadron of steam Gun Boats in the English Channel and was awarded the Distinguished Service Cross (DSC) for bravery. In 1946, Peter Scott founded the Severn Wildfowl Trust, now the Wildfowl and Wetlands Trust (WWT), at Slimbridge in Gloucestershire. Over the years Peter led worldwide ornithological expeditions becoming a television personality and with his BBC natural history series ‘Look’, which ran from 1955 to 1981. In 1956, Peter Scott appeared in This Is Your Life, hosted by Eamonn Andrews in the Kings theatre, Hammersmith, London. He also took up gliding and by 1963 he had become British Champion. He was the chairman of the British Gliding Association (BGA) in 1968 and 1969 and was responsible for involving Prince Phillip in Gliding who is still patron of the BGA. 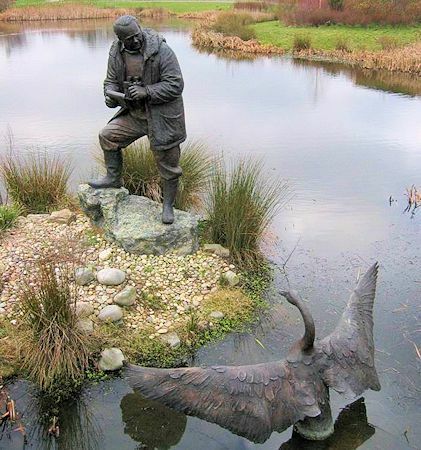 Statue of Sir Peter Scott at WWT London Wetland Centre. Peter Scott wrote and illustrated several books including his autobiography The Eye of the Wind which was published in 1961. Bizarely, Peter Scott wa responsible for giving the Loch Ness Monster its scientific name of Nessiteras rhombopteryx based upon a blurred underwater photograph so that it could be registered as an endagered species. In 1962, he and David James MP, co-founded the Loch Ness Phenomena Investigation Bureau. David James was the Polar adviser on the movie 'Scott of the Antarctic'. Peter Scott was Knighted in 1973 for his contribution to the conservation of wild animals. Peter Scott was Chancellor of the University of Birmingham from 1973 to 1983 and was awarded an Honorary Degree from University of Bath in 1992. On the 29th August 1989, Peter died of a Heart Attack. He was the founder president of the 'Society of Wildlife Artists' and President of the 'Nature in Art' trust, a role in which his wife Philippa succeeded him. 1973 - He was Knighted.